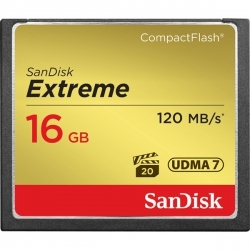 The perfect combination of shooting speed (up to 85MB/s), continuous video performance guarantee (VPG-20) and transmission speed (up to 120MB/s, 16GB 128GB memory card). The most suitable for high order order DSLR camera and HD camera SanDisk Extreme CompactFlash memory card, to provide first-class read / write speed, with fast dynamic shooting, and enable fast file transfer functions. 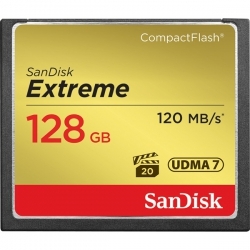 The memory card is equipped with video performance guarantee (VPG-20), to provide 20MB/s for recording data to the minimum speed support quality full HD video recording function (1080p). Up to 85MB/s (567X) memory card write speed, so you can make full use of burst mode photography function, and by virtue of its transmission speed up to 120MB/s, enjoy efficient work flow. 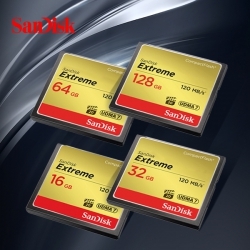 This memory card capacity up to 128GB, can provide plenty of storage space for full HD video and photo RAW.